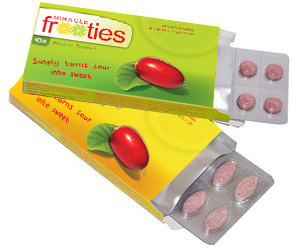 Dissolve a Frootie on your tongue and the effect will last from 15 minutes to 2 hours, depending mostly on what you eat. Important: Miracle Fruit needs to coat your tongue (mouth) in order to have an effect, so don't swallow it! You should hold it in your mouth and swoosh it around, until the Frootie (Miracle Berry tablet) dissolves completely. Miracle Fruit or Synsepalum dulcificum is a plant, native to West Africa. Miracle Fruit berries cause sour and bitter foods, such as lemons, pineapples and kiwi, consumed after eating Miracle Fruit berries, to taste sweet. Miracle Frooties are guaranteed to contain extract from first grade Miracle Fruit berries. Fresh miracle berries are freeze dried moments after being picked to produce powdered Miracle Berries with the same effect as fresh berries. The powder is then compressed into Froooties (dragees) for easier usage.